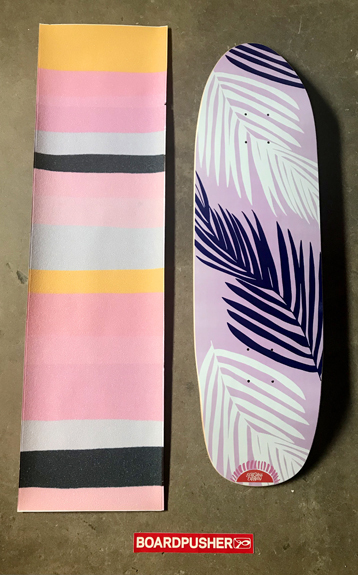 Christie Russert mixed and matched a couple of her Sunshine Canteen graphics to assemble today’s top and bottom Featured Deck & Griptape. Christie is “inspired by vintage surf and skate, camping and hippie culture” and “her illustration work is primarily abstract pattern that is inspired by elements of nature.” Find more of Christie’s artwork at sunshinecanteen.com, follow her on Instagram @sunshinecanteen, and pick up one of her skateboard designs at BoardPusher.com/shop/sunshinecanteen. Create custom top and bottom graphics on several different skateboard shapes at BoardPusher.com. ← Featured Deck of the Day: Wolf by Alpha Wolf Co.